Northeastern South Carolina History Trail Era and Time Period Overview. This overview presents a brief synopsis of how the listed eras and time periods relate to the important and colorful history of the Northeastern South Carolina region from before its early inhabitants to the modern day. Click on any of the period titles to view the site entries it contains. Native American cultures flourished in pre-Columbian South Carolina. When the first English colonists settled in the Colony of Carolina, they encountered dozens of Indian tribes with distinctive cultures and languages. Established near modern Charleston in 1670, the English Colony of South Carolina was established during the reign King Charles II, and was divided into North and South Carolina in 1729. During the Revolutionary War, South Carolina recorded more battles and skirmishes than any other state, and the fighting in the Palmetto State proved decisive to American victory and nationhood. 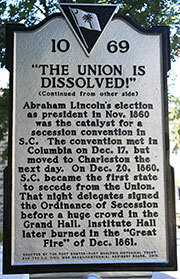 The Civil War began in South Carolina, when Confederate forces bombarded Fort Sumter in April of 1861. Numerous military operations occurred in the state, including Sherman's March - which left Columbia and much of the Palmetto State in runs. In the first half of the 20th century, South Carolina sent many of its sons to faraway France in World War I. Back home, a boll weevil infestation ruined cotton farming for many families, causing a wave of out-migration, followed by the Great Depression. During the Second World War, while numerous South Carolinians served in distant theaters of the war, while a multitude of military bases was established in the Palmetto State from the coast to the Upcountry. Modern South Carolina remained a leading agricultural state, but also became a major Southern business region with a thriving textile industry, and emerged as a national center of tourism.